Quantum dots (QD) can be made from tiny crystals of semiconductor material, around 10 nanometers in size. The electron-hole pairs in this structure are confined, resulting in a quantization of energy levels analogous to those of an atom – hence quantum dots are often dubbed ‘artificial atoms.’ Like an atom, a QD’s energy levels can be manipulated using lasers and magnetic fields. The fluorescing wavelengths can be tuned by altering the crystal size. Semiconductor quantum dots are attractive for quantum information processing because the technology for integration with modern electronics already exists. Fluorescence occurs when an excited electron relaxes back to the ground state, and the color of the emitted light is a function of how far in energy the electron travels. In this type of quantum dot, the spacing between the conduction and valence band is inversely related to the size if the crystal. The smaller the dot, the more energy is needed to create excitations, and accordingly higher energy (bluer) light is emitted. During manufacturing, quantum dots can be tuned to fluoresce at specific wavelengths of light. Unlike atoms, where you would need to swap in a new element to achieve a different spectrum of emitted light, quantum dots of a particular material can emit a wide range of colors simply by adjusting the size. Their fluorescence range neatly corresponds with the visible spectrum, and thus there is also interest in manufacturing light-emitting diodes from quantum dots. In 1997, Daniel Loss and David P. DiVincenzo proposed a quantum dot-based spin-qubit quantum computer. 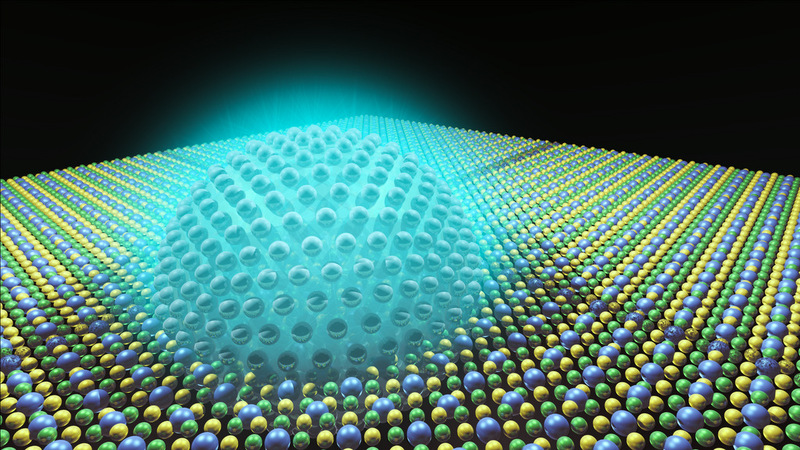 Single electron spins can be isolated inside a fabricated quantum dot architecture. Here, the quantum dots are fabricated between layers of semiconductor. At low temperatures, the electrons in this system move in a flatland, constrained to just two dimensions. The quantum dot provides further confinement, localizing these electrons in space. Scientists can apply electric fields to the quantum dot leads, allowing a single electron to leave the two-dimensional gas and effectively become trapped in a well. Here the electron spin functions as a qubit. However, the coherence time is limited in the single dot case because the quantum system is disturbed by the surrounding bath of semiconductor nuclei. This has lead to research in double and triple quantum dot structures, wherein the decoherence processes can be circumvented. Recent JQI work includes a theoretical proposal for a double quantum dot qubit that contains up to six electrons, rather than the usual one or two. Another research group has proposed what is known as the resonant exchange qubit in a double quantum dot. In yet another avenue of research, JQI experimentalists embed quantum dots in photonic crystals and perform quantum logic operations. Quantum dots also have uses in bio-medical research. Their small size means they can pass unimpeded through the body, and their tunable florescence can be employed as a biomarker for medical imaging.